A dead Manchurian Ash (probably Fraxinus mand­schur­ica). Note that its trunk is far from straight. This condition is called sinuosity. It is thought to result from the tree's attempts to reach for light as openings appear in the forest canopy. 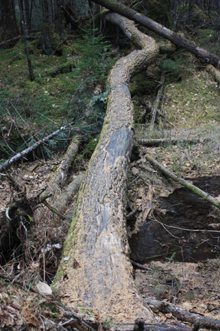 (See Charismatic Megaflora: What do Old Trees Look Like? by Neil Pederson) As one canopy opening is filled by foliage of taller trees, and new openings appear, the ash has had to "change course" several times. If we regard the tree as being a problem solver, with the search for light being the problem it's solving, it seems to have led a life in which the solutions it finds repeatedly (and rather suddenly) become invalid. Consequently, it has had to search for new solutions to the new problem, and this has led to sinuosity. This tree's experience suggests that for us as humans, Type III errors — that is, correct solutions to wrong problems — can arise suddenly out of correct solutions to correct problems. We might be engaged in solving a correct problem correctly, and suddenly, without warning, the problem's "validity" vanishes. If we persist in solving that problem then we would be committing a Type III error, even though we weren't when we began the effort. In this way, we can commit a Type III error by addressing technically a problem that at the outset was fundamentally technical, but which becomes political as the technical solution develops. Photo courtesy Neil Pederson. Statisticians identified Type I and Type II errors almost 70 years ago. In brief (possibly too brief), a Type I error is a false positive and a Type II error is a false negative. These mistakes can be costly indeed, but they are topics for other days. The concept of Type III errors is based on a generalization of these first two. The approach I favor is that of Raiffa (see below), who identified Type III errors as those in which one solves the wrong problem correctly. This definition has wide applicability in the realm of workplace politics. You're in charge of a large, innovative effort for your company, MegaBlunder. Similar but smaller and less complex efforts at MegaBlunder have used SupplierA with satisfactory but not stunningly successful results. Unfortunately, because of the size, complexity, and novelty of your effort, SupplierA cannot meet all your needs. SupplierB can, but because of a bad experience with SupplierB some years ago, there is a "soft" ban of SupplierB, and using them is deprecated. You believe on strong evidence that SupplerB's past is now behind it, but there's some political risk involved in selecting SupplierB. A review of your effort is scheduled for next week. What do you do? Although this example is expressed in terms of supplier choice, other forms include choices of technologies, locations, markets, and people. We'll stay with the supplier example for concreteness. Most people address such problems by devising strong defenses of their positions. They gather glowing references from customers of SupplierB, carefully researched evidence of the shortcomings of SupplierA's offerings, and evidence of the strength of SupplierB's offerings. They perform risk analyses of the two alternatives. PowerPoint slides galore. Sometimes it works. the wrong problemcontent-based approaches arise when these approaches comprise Type III errors. When the real problem is political, rather than one of supplier capability, these approaches are correct solutions to the wrong problem. In our example, suppose that the basis of the ban on SupplierB was actually the damaged relationship between SupplierB's former CEO and MegaBlunder's former CEO. The excuse might have been a pattern of late deliveries, but trust was the real issue. Both CEOs have long since moved on, but the ban remained. A more suitable approach might involve consulting your network to gain a deeper understanding of the issue, and then, possibly with help from others on the executive team, working to remove the ban. Would you like to see your comments posted here? rbrenbqNLcLpMZPXwNlgSner@ChacqmnqQwGaunDnvAQAoCanyon.comSend me your comments by email, or by Web form. I offer email and telephone coaching at both corporate and individual rates. Contact Rick for details at rbrencTkZzzXqApfLIMNyner@ChacgAehXBgaKZDyXSaooCanyon.com or (650) 787-6475, or toll-free in the continental US at (866) 378-5470.